NEW from the bestselling illustrator of Uni the Unicorn! A new mythical--and totally rad--character to laugh with and love. Vlad is always getting in trouble at Miss Fussbucket's School for Aspiring Spooks. Unlike the other little vampires, witches, mummies, and ghosts, Vlad isn't very interested in learning spookiness. That's because...Vlad loves to skateboard! How can he possibly think about being a good spook when all he wants to do is practice his latest gnarly trick? Maybe Vlad can find a way to do both! 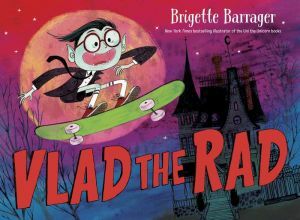 Brigette Barrager's debut author-illustrator project is full of energy, fun, and sweet tricks! Passionate kids will identify with Vlad, and will take heart from the way he combines his love of skateboarding with his schoolwork. A perfect Halloween read-aloud for the classroom!